Local media have gone so far as to describe the white paper as an outright repudiation of the ‘one country, two systems’ principle that has guided China-Hong Kong relations since Deng Xiaoping (邓小平) coined the concept in the 1980s during the initial handover negotiations. Universal suffrage, however, means something different to leading members of the Chinese Communist Party (中国共产党) than it would to a US-based or European-based democrat. Beijing has warned that only candidates who ‘love China’ will be permitted to run for the job of chief executive. Realistically, pro-democracy activists worry that means Hong Kong residents will be offered a false choice from among hand-picked candidates deemed acceptable by the CCP. The referendum, which opened on June 22 and remains open, asks Hong Kong residents to choose from among three options to elect the next chief executive in 2017, all of which involve relatively open nominating processes. So far, the organizers claim nearly 750,000 Hong Kong residents have participated. China’s government has denounced the vote as illegal, and official media within the PRC have rejected the vote in even harsher terms. Though Occupy Central and Hong Kong’s other democracy activists have pledged to hold an ‘Occupy Wall Street’ sit-in after the results of the referendum are released, it doesn’t seem like a fight that the Chinese government is willing to allow them to win. The movement, and the backlash against Beijing’s ‘white paper,’ may ultimately convince the CCP leadership to allow broader input that it might otherwise prefer for nominating future chief executives. But there’s virtually zero chance that the CCP leadership would allow a populist, anti-Beijing candidate to become Hong Kong’s chief executive. Not in 2017. Not in 2027. Realistically, that means the 2017 election might provide only marginally more ‘universal suffrage’ than the March 2012 contest, whereby a 1,200-member Elections Committee, comprised of representatives from across 38 business, civic, labour and political sub-sectors, elected the chief executive. It’s not inconceivable that in 2017, a similar committee will determine the universe of contenders for chief executive. In that race, Henry Tang, who had for nine years served as finance secretary and chief of administration in the Hong Kong leadership, enjoyed, as the initial frontrunner, support from much of the Hong Kong business and real estate elite. But revelations in the Hong Kong press about unauthorized upgrades to his residence, along with allegations of extramarital affairs, doomed his chances, further dampened by simultaneous graft and corruption allegations against outgoing chief executive Donald Tsang. Leung Chun-ying (梁振英), characterized as a cunning ‘wolf’ by the Hong Kong media, in contrast to Tang’s plodding ‘pig,’ also benefitted from higher public approval at the time, according to poll surveys. Leung, previously the convenor of Hong Kong’s executive council, a policymaking body, ultimately won by a vote of 689 to 285. Leung’s surge in popularity, however, was short-lived. Soon after his election, he was also determined to have engaged in unauthorized improvements to his residence. Leung (pictured above) also turned out to be just as pro-Beijing as Tang, even delivering his inaugural address in Mandarin, not the Cantonese dialect that widely predominates among Hong Kong’s residents. Leung, who went on leave from yesterday until Friday, said it was wrong to put “the people of Hong Kong and China on confronting sides”. In a strongly worded editorial published on Monday, the Global Times warned that since “the Basic Law reflects the will of the whole nation … more than 1.3 billion people have the right to speak on Hong Kong’s political reform”. 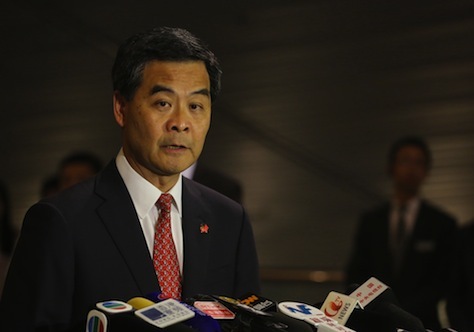 Leung said that “no matter how many people voted”, and no matter whether the number was “inflated”, the majority of residents who took part were expressing their wish to elect the city’s leader by universal suffrage in 2017. The Global Times described the Occupy poll as “illegal”, but Leung clarified that the people who voted would face no criminal liability. However, he reiterated that public nomination “does not comply with the Basic Law”, saying that there were no grounds for people to call for universal suffrage to be compatible with international standards. It’s worth noting throughout the British colonial period from 1841 to 1997, Hong Kong residents never once had an opportunity to elect their London-appointed governor. So even the stage-managed election that Beijing is threatening to foist on Hong Kong’s 7.15 million people in three years represents more democracy than the British ever granted Hong Kongers. Hong Kong’s legislative council is already elected through partial direct suffrage. Of its 70 seats, 35 are directly elected in geographic constituencies, while 35 are elected through ‘functional constituencies’ which include many professional, business or other special interest groups. Accordingly, Beijing tolerates a broad degree of press freedom, political expression and Internet liberty that’s not permitted anywhere else on the Chinese mainland. It’s why Hong Kong residents can participate in demonstrations against the Chinese government over everything from democracy in 2017 to Tiananmen Square commemorations. Hong Kong’s special status, however, may continue even beyond 50 years if CCP leaders decide that it’s vital to maintain Hong Kong’s status. It’s no secret that Chinese leaders are promoting Shanghai’s growth as a competing global financial center — and Shanghai could well displace Hong Kong before 2047. But preserving the ‘one nation, two systems’ approach could be an inducement for Taiwan’s eventual reunification into the PRC, a long-held dream of China’s leadership. 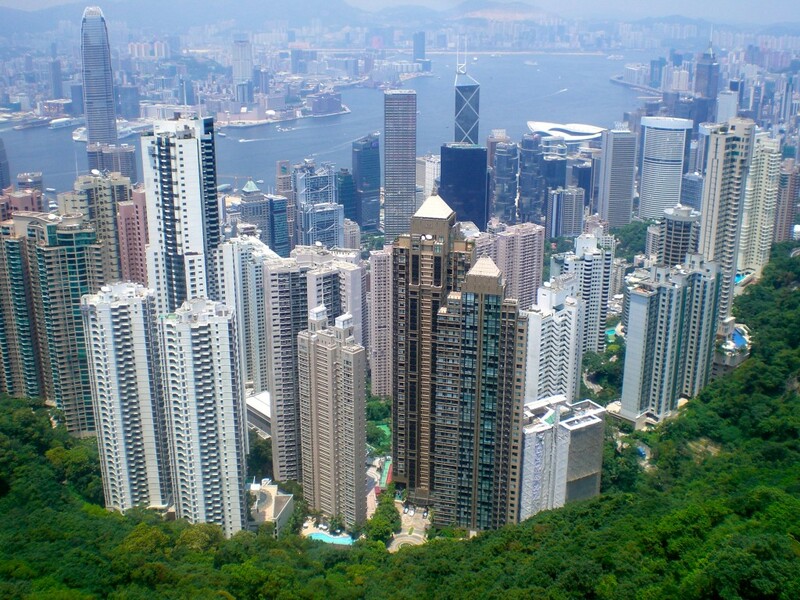 Top photo credit to Kevin Lees — the view of Hong Kong Central from Victoria Park, July 2008.